The NARVIS lab is our research laboratory at Chirurgischen Klinik und Poliklinik - Innenstadt, LMU München providing an interdisciplinary platform for our research activities. Since 2004, a strong collaboration between surgeons and computer scientists has been established and resulted in a large number of international publications and various research projects. Main topic of projects running at NARVIS lab addresses medical applications for Augmented Reality Technologies. The two main research interests at NARVIS lab are the Camera Augmented Mobile C-arm and different projects for in-situ visualization using a stereo video see-through head mounted display. There is very limited payed parking available and no free parking at all. Therefore, it is strongly recommended to use public transport. When reaching the end of tracks, head right to the south exit of the station. After leaving the station, cross Bayerstr. and continue southwards on Goethestr. After approx. 500m, turn left on Nussbaumstr. Cross Schillerstr. and continue on Nussbaumstr. After approx. 100m you will reach the main entrance of Chirurgische Klinik on the left side. After entering the building use the staircase on the left side. At the staircase you will find signs leading you to the lab. Inside the building look for Station 3, which is on the second floor. In the same floor, on the opposite side of Station 3, you'll find our room C2.06. Use subway lines U1, U2, U3, or U6 to Sendlinger Tor. Exit the station to Nussbaumstr. After approx. 500m you will reach the main entrance of Chirurgische Klinik on the right side. Inside the building look for Station 3, which is on the second floor. In the same floor,on the opposite side of Station 3, you'll find our room C2.06. After you entered the building, turn left, and go towards the staircase at the end of the entrance hall. From here, the way to the Narvis lab is marked by signs. You can also ask the desk officer at the entrance desk ("Pforte") at Chirurgische Klinik, Nussbaumstr. 20 to call us (4368). We will then pick you up there. If you are working at NARVIS Lab and if you need access to the infrastructure such as internet, keys, phone numbers here is the place to get information. Advanced visualization is getting increasingly important for the operation room of the future. The increasing number of available medical images must be presented to surgery team in new ways in order to support them rather than overloading with more information. 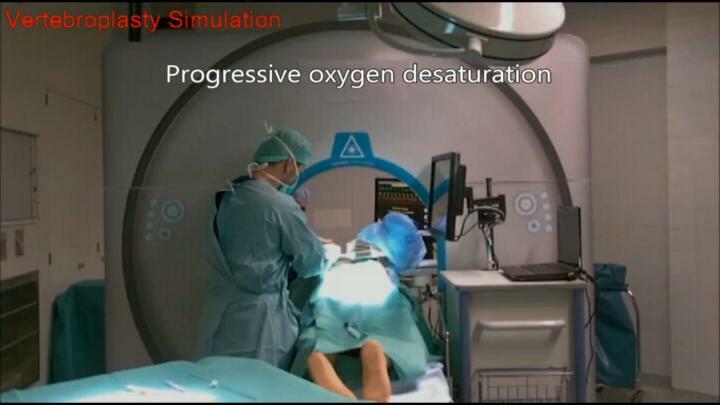 In our project NARVIS we integrate an HMD-based (head mounted display) AR system into the operation room for 3D in situ visualization of computed tomography (CT) images. The final system aims at spinal surgery. The work is in close collaboration with our project partners “Klinikum für Unfallchirgie” at LMU, A.R.T. Weilheim, and Siemens Corporate Research in Princeton. The project is funded by Bayerische Forschungsstiftung. The Microsoft Kinect provides a color and a depth image. Using OpenNI? and PrimeSense? NITE we can get the skeleton of a person standing in front of the Kinect in real-time. We register a CT dataset to this skeleton and do an Augmented Reality overlay of the CT and the person. 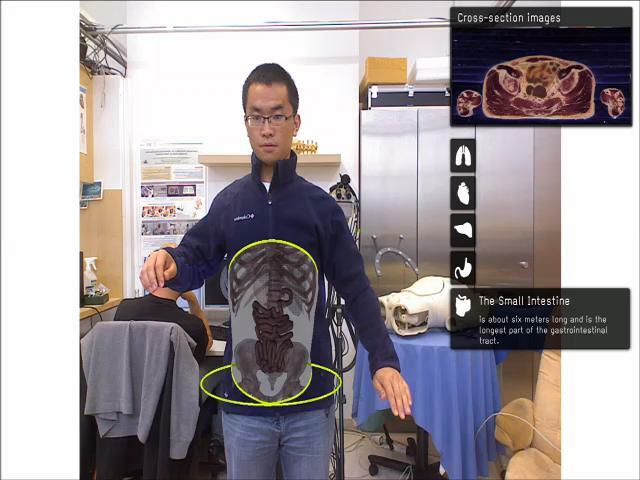 Using context and focus visualization we only show the CT through a virtual window, while still showing the person. The Kinect is positioned next to a big screen. When standing in front of the system, the system acts like a magic mirror that allows seeing inside yourself. Such a system can be used for educational purposes to teach anatomy. The system is currently a prototype. It does not show the CT of the person in front of the monitor, but a CT of another person. We use the Visible Korean Human dataset that has been provided to us by Prof. Min Suk Chung. In today’s ORs more and more operations are performed employing minimally invasive procedures. Surgical instruments are inserted through a tiny cut on the patient’s skin, the port to the inside of the patient. In some cases endoscope cameras record video images of the operation site that are presented on a monitor. As a consequence of this technique, the surgeon’s field of view is divided into several work spaces, the monitor, the patient and information of medical imaging data presented on a third station. The missing direct view on the workspace complicates intuitive control of surgical tools. In contrast to open surgery the physician has to collect information from several fields of view at the same time and fuse information mentally to create a complete model of his working space, the operation site. The minimally invasive intervention vertebroplasty was determined as a suitable medical application to bring an Head Mounted Display (HMD) into the OR for augmentation of surgical instruments and medical imaging data. In-situ visualization with an HMD presents all available imaging data and navigational information in one field of view. The objective of vertebroplasty is the insertion of cement into weak and brittle vertebrae through a trocar for stabilization. In this case the view on the inside of the patient is not provided by an endoscope camera. 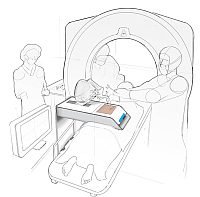 However, since the operation is performed under a CT scanner, imaging data is permanently updated to check position of the trocar and amount of inserted cement. 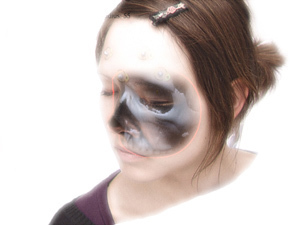 Imaging data is presented on a monitor and has to be mapped mentally by the surgeon on the real operation site. Coronary artery diseases such as atherosclerosis are the leading cause of death in the industrialized world. In this project, we develop computational tools for segmentation and registration problems on intravascular images including IVUS (Intravascular Ultrasound) and OCT (Optical Coherence Tomography). One sample component of this project is Automatic Stent Implant Follow-up from Intravascular OCT Pullbacks. The stents are automatically detected and their distribution is analyzed for monitoring of the stents: their malpositioning and/or tissue growth over stent struts. In many minimally-invasive interventions, catheters are inserted into the body and guided to a region of interest with the help of fluoroscopic imaging (low-dose X-ray image sequences). 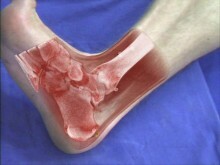 Due to patient motion, the navigation can be disturbed, and the physician needs a longer time for treatment. This is hazardous in terms of radiation for both, physician and patient. In order to overcome these problems, suitable image-based compensation methods to resolve (non-) rigid motion can be applied. 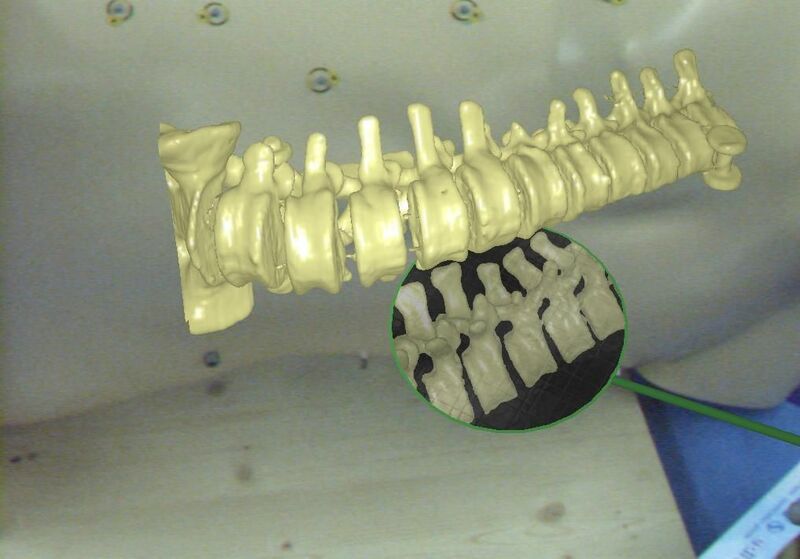 In this project, patient motion is analyzed and suitable compensation algorithms are developed. 1. In the planning phase, a modified graph cuts algorithm automatically segments the aorta and aneurysm, so the surgical staff can choose an appropriate type of stent to match the segmented location, length, and diameter of the aneurysm and aorta. By visualizing the defined stent graft next to the three-dimensionally reconstructed aneurysm, mismeasurements can be detected in an early stage. Our main goal is the creation of an interactive simulation system that predicts the behaviour of the aortic wall and the movement of the implanted stent graft. 2. 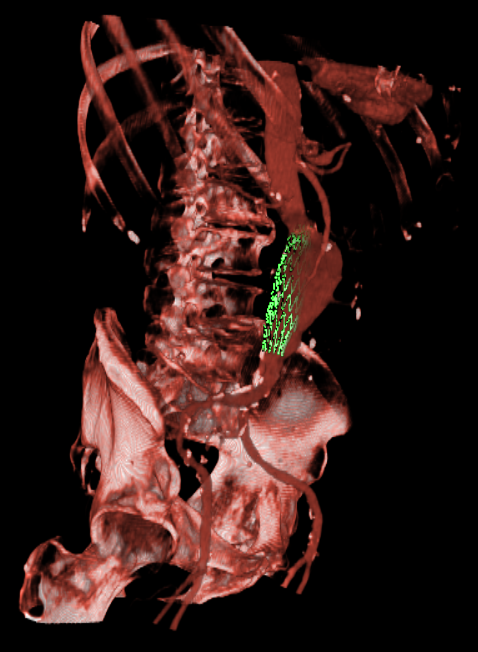 During implantation of the stent graft, after an intensity based registration of CTA and angiography data, the current navigation can be visualized in the 3D CT data set at any time. This includes solutions for electro-magnetic tracking of catheters as well as guide wires and stent grafts. 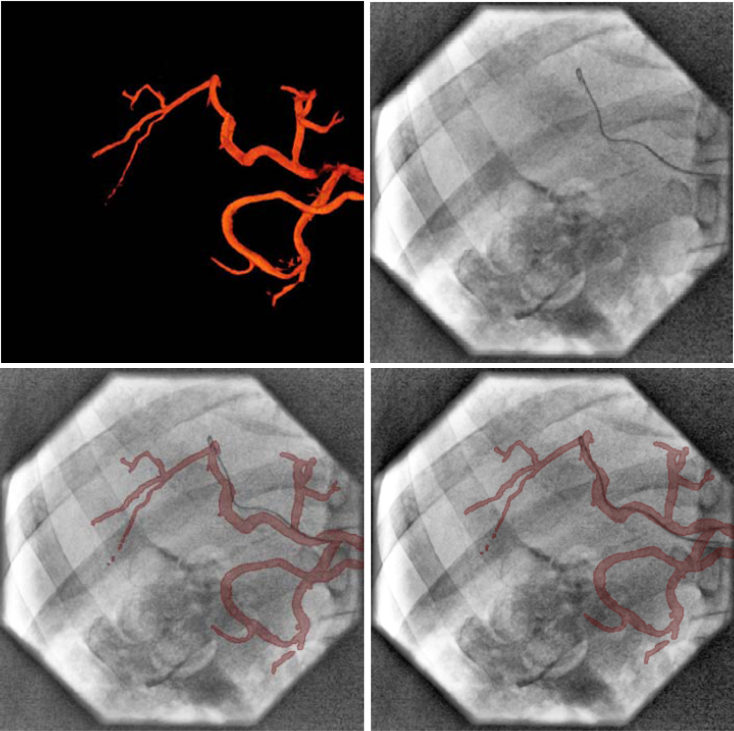 Eventually, Our main goal is the creation of solutions that enable the surgeon to enhance the accuracy of the navigation and positioning, along with a minimum use of angiography, leading to less radiation exposure and less contrast agent injection. 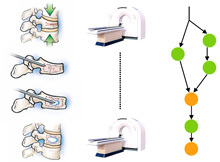 In this project, we aim at discovering automatically the workflow of percutaneous vertebroplasty. The medical framework is quite different from a parallel project , where we analyze laparoscopic surgeries. Contrary to cholecystectomies where much information is provided by the surgical tools and by the endoscopic video, in vertebroplasties and kyphoplasties, we believe that the body and hand movement of the surgeon give a key insight into the surgical activity. Surgical movements like hammering of the trocar into the vertebra or the stirring of cement compounds are indicative of the current workflow phase. The objectives of this project are to acquire the workflow related signals using accelerometers, processing the raw signals and detecting recurrent patterns in order to objectively identify the low-level and high-level workflow of the procedure. The goal for the modern learner is to arrive at the bedside of a real patient with proficiency already demonstrated in the requisite skills. 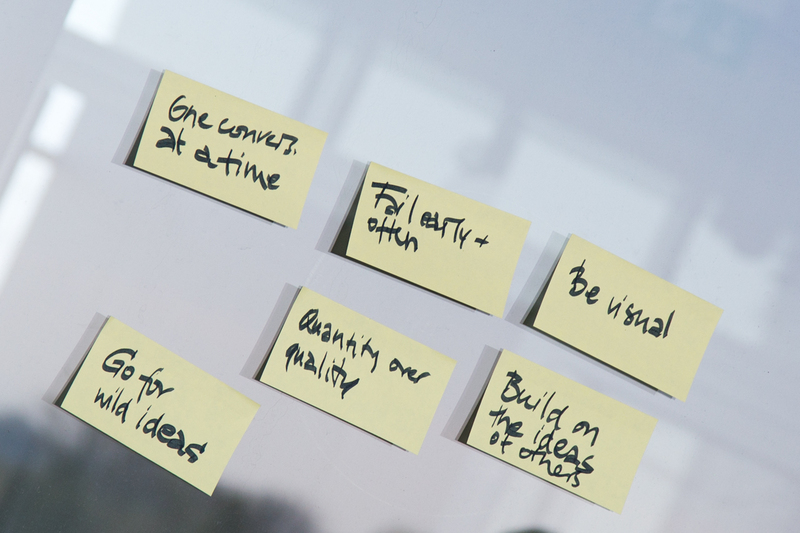 In this process, the most expensive and scarce resource is the experienced clinical instructor. In this area, the synergy between computer-assistance and real medical instrumentation can make invaluable contributions by enabling focused and deliberate practice to further motivate the trainee. Thus, clinical education specialists need a customizable medical simulation environment to experiment with new learning models and training regimens. To our knowledge, we have designed and evaluated the first VR simulator with the capacity to control the introduction of adverse events or complication yielding a wide spectrum of highly adjustable crisis simulation scenarios. Moreover, our design is the first that combines a VR simulator with a computerized mannequin simulator in an OR crisis simulation scenario.